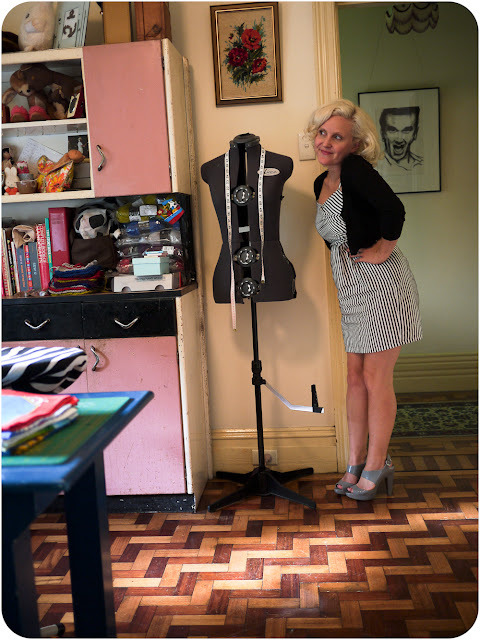 Veronica Darling: Whose sewing room is this? WHAT?! 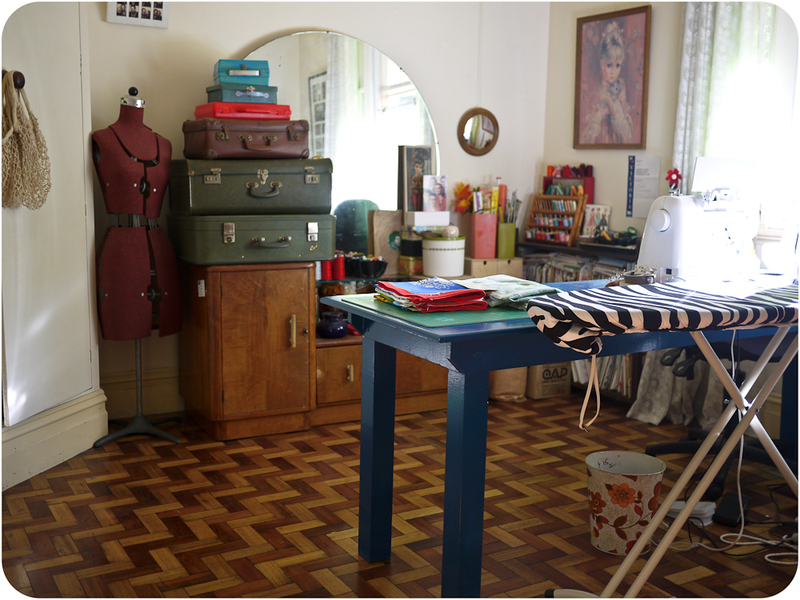 A floor in my sewing room?! I've never seen that since I've moved in! Yes LOL-stars, I've spent a *little* while cleaning up and ordering my darling room, so that everything has a home. It's how Husbie and I can have a peaceful mind: when things have a home. Like how the wrapping paper lives in the 'stationary' drawers, and when zippers (still in cardboard) are with the knitting needles in the two old bakelite container things. I've had the table in the middle of the room for a bit now, and it's great for holding fabric out and cutting pattern pieces, but I don't like walking around to the ironing board all the time. I might 'box' myself in when I sew next time, and have the ironing section in at the end of it all, so I can just 'roll' on the chair over there. 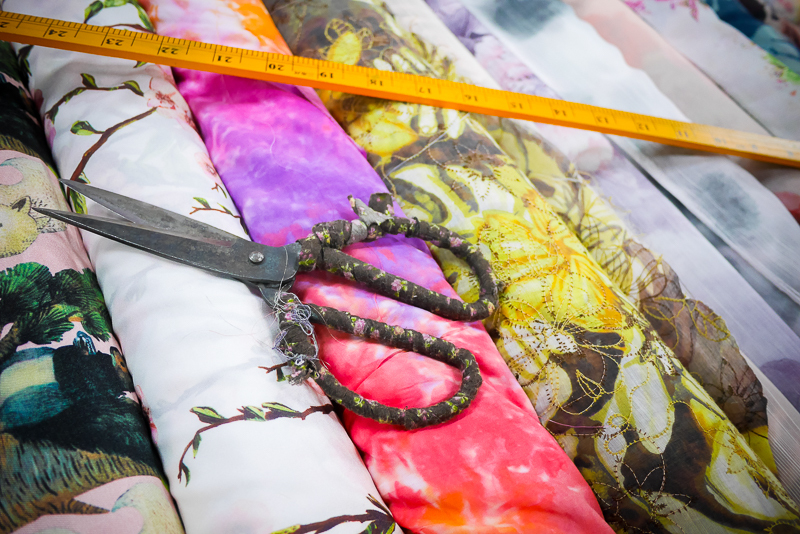 Saves time and energy Lazy Seamstresses! I ran outta space for total colour coordination, and it's hard sometimes with prints! Not that I've counted but 95% of this stash is probably op shopped/thrifted. Note how I hardly wear any blue things, but have shitloads of the stuff. I'm not fond of any of the brown piles either, not much of it goes with my platinum hair colour. Dilemmas! And here's my dresser, originally a kitchen one, but now a sewing dresser! I've cleaned it up as best I can, but it must have been stored in a garage or somewhere heaps dusty and not weatherproof, as there are permanent marks and the counter top is lifting on the far corner. I might repaint it one day. It was $30! On sale from this awesome second hand store in Yarraville! ARGH! I'll show you some detail shots, and what I'm working on at the moment, tomorrow! I'm back at work in the morning! What about you? Oooh wow, it looks AMAZING! that fabric bookcase is THE BEST! Your sewing room looks fab! Wow, it looks great!! I used to have a tidy little sewing room but it's been transformed into a nursery and my darling sewing desk and trinkets have been relocated to a dark basement. :( You inspired me to brighten it up down there and use the space! Thank you!! Looks lovely! Can't wait to see all your creations that come out of there. Happy New Year! holy moly look at all that fabric! what an epic stash you have. Mine is sooo tiny in comparison. Isn't it great to have everything in its place. I am so like you and need it to be like that so I can relax. My sewing room could do with a bit of a tidy actually. I love all your gorgeous furniture too. 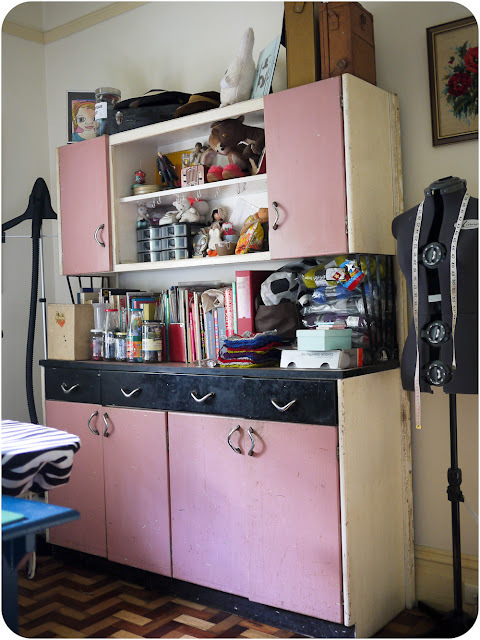 I love everything about your sewing room, from the style to the colors to the HUGE fabric stash! i seriously, SERIOUSLY love those trunks!!! Lovely! I'm going to start cleaning my room now - this is inspiring! Who is organised now!? Love admiring mine and anyone elses fabric stashes- all those possibilities! I'm totally swooning over your gorgeous space! 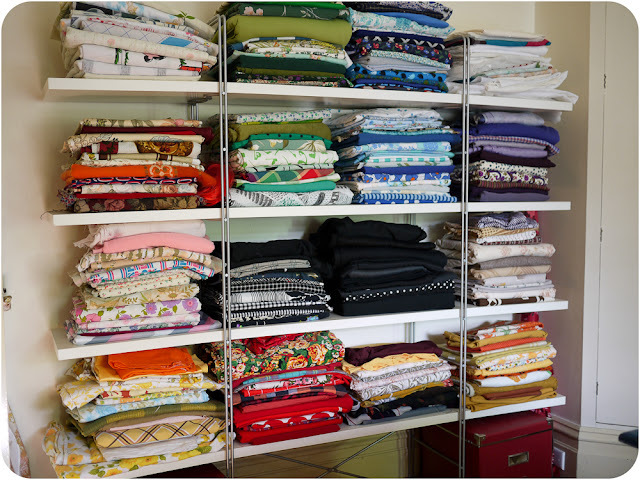 Especially all the color organized fabrics! !